Our browser-based media management software handles upload, encoding and playback. Manage & search your media through collections & tags. Easily download and share media. Add automated transcription and captioning and all this in an intuitive user interface. Manage your media through collections & tags. Control who can upload media, download media or edit metadata with flexible user management. Quickly share your media with your client, ask for feedback while keeping in control. Enable external download and upload via simple share links. Get feedback and approvals from your customer with time-stamped comments and threaded replies. Intuitive, efficient media organisation and metadata entry. Annotate media files with notes for the editor or director to consult during editing. Assist your team with audio transcription using speech-to-text technology. Search, verify and edit your transcripts. Create frame accurate captions at broadcast quality in original and foreign languages using speech-to-text technology and intelligent spotting. Build a rough-cut assembly and send your assembly to Avid Media Composer or Adobe Premiere Pro as a sequence for immediate editing. Export any selection of clips to your preferred edit suite as an enriched sequence for immediate editing. Export transcript or metadata to multiple document formats. 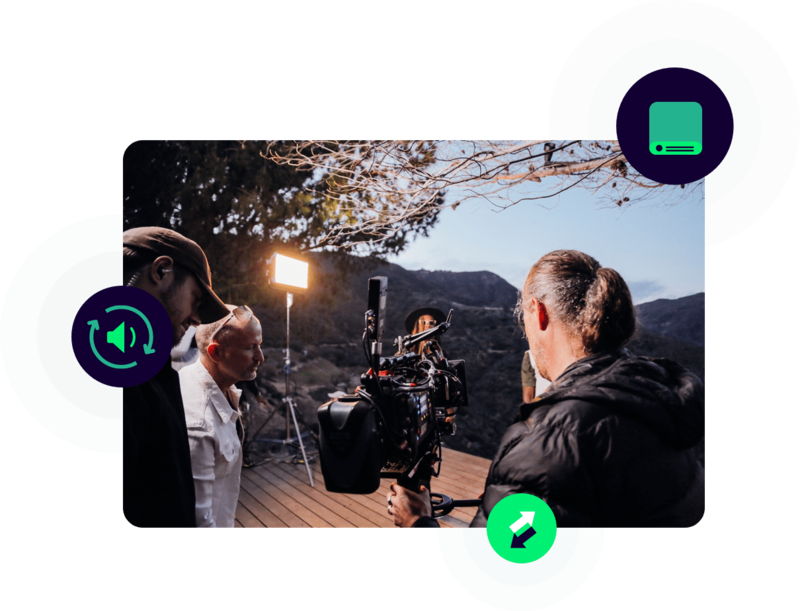 Our Swiss army knife for DITs and post production assistants allows film and video productions to keep raw materials on their local systems while uploading only high-quality proxy versions to Limecraft Flow. Available for Windows and Mac. Fast checksum-verified backup of source media to multi destinations, in parallel or cascaded. Fingerprint tracking to track the media upstream. Easily register files in the library without copying. Import media sync information to leverage audio synced proxy transcoding. Management of source and transcoded clips in one library with native playback. Extraction of metadata from clips and sidecar files for better organisation upstream. Multi format and multi destination transcoding to different resolutions with support for look creation. Upload transcoded clips to Flow even from locations with very low bandwith. Media Sync easily synchronises separately recorded audio and video rushes based on timecode to create audio synced proxies. Batch download multiple clip formats from Flow with folder structure templates to support local media file organisation or remote editing. The APIs which help our partners build custom integrations are the same APIs we use ourselves to build our apps. This means we can always be sure that they work as they should and make updates and adjustments when needed. Our extensive REST API opens up the entire media backbone for accessing and modifying by any third-party module. This includes accessing all information about productions, media, metadata and users. We understand that different customers have different needs in terms of functionality and configuration. Our configurable system allows for adjustments when needed.